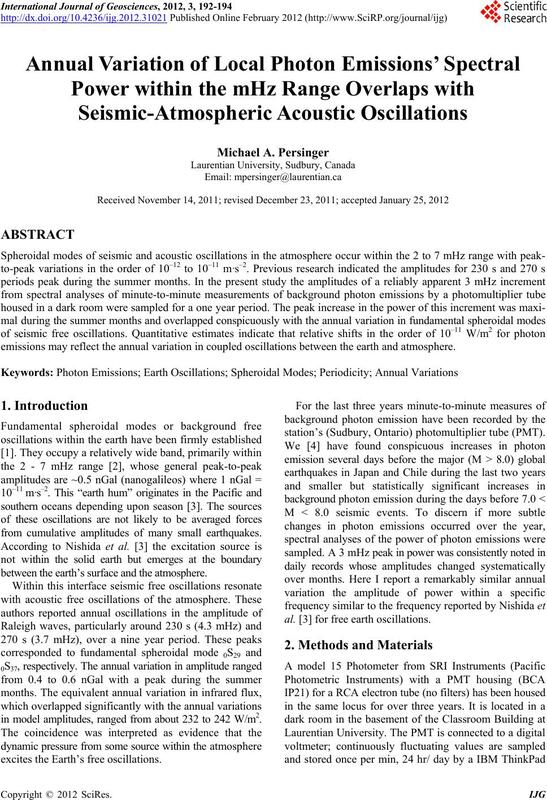 emissions may reflect the annual variation in coupled oscillations between the earth and atmosphere. from cumulative amplitudes of many small earthquakes. between the earth’s surface and the atmosphere. in model amplitudes, ranged from about 232 to 242 W/m2. excites the Earth’s free oscillations. station’s (Sud bury, Ontario) photomultiplier tub e (PMT). al. for free earth oscillations. tha t r ang ed f rom 0 .2 to 0. 6, w as obt ain ed f or each month. 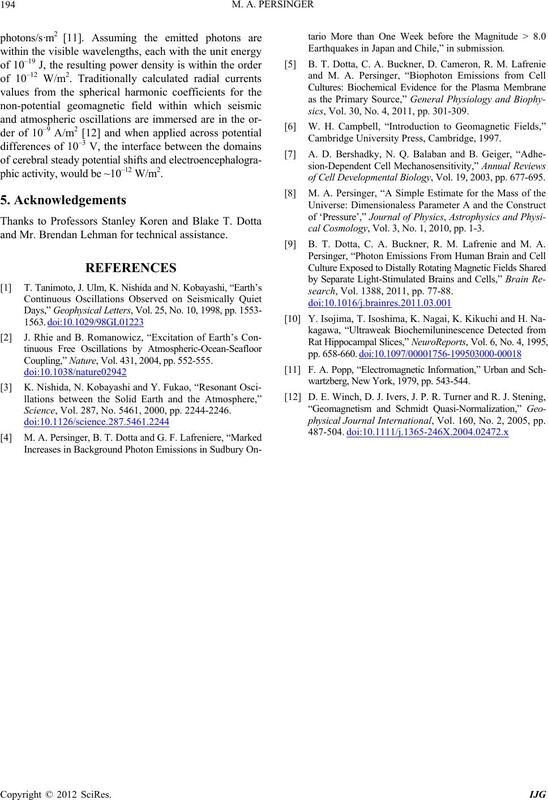 Nishada et al’s data  that were replotted for this paper. 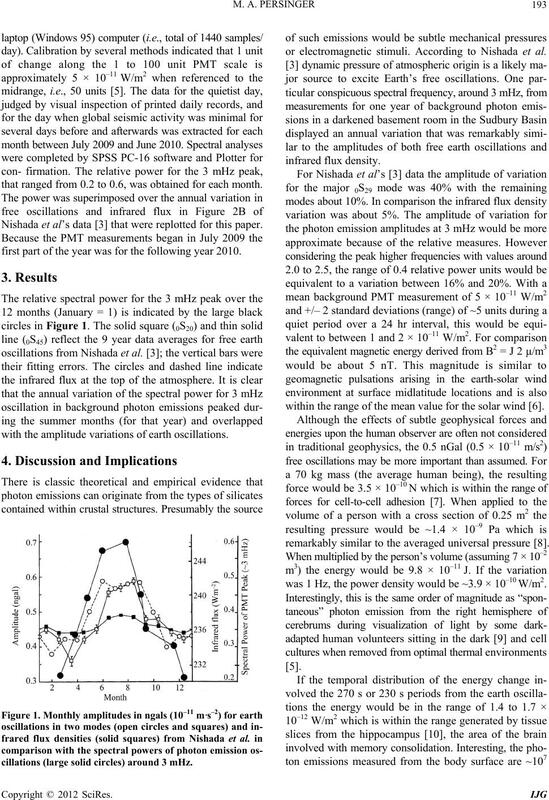 first part of the year wa s for the following year 2010.
with the amplitude variations of earth oscillations. cillations (large solid circles) around 3 mHz. or electromagnetic stimuli. According to Nishada et al. within the range of the mean value for the solar wind . remarkably similar to the averaged universal p ressure . was 1 Hz, the power density would be ~3.9 × 10–10 W/m2. phic activity, would be ~ 10–12 W/m2. and Mr. Brendan Lehman for technical assistance. Coupling,” Nature, Vol. 431, 2004 , pp. 552-555. Science, Vol. 287, No. 5461, 2000, pp. 2244-2246. Earthquakes in Japan and Chile,” in submission. sics, Vol. 30, No. 4, 2011, pp. 301-309.
of Cell Developmental Biology, Vol. 19, 2003, pp. 677-695.
cal Cosmology, Vol. 3, No. 1, 2010, pp. 1-3. B. T. Dotta, C. A. Buckner, R. M. Lafrenie and M. A.
search, Vol. 1388, 2011, pp. 77-88.
wartzberg, N ew York, 1979 , pp. 543-5 44.
physical Journal International, Vol. 160, No. 2, 2005, pp.